At MIT, Ratti directs the Senseable City Lab, a research group that explores how new technologies are changing the way we understand, design and ultimately live in cities. 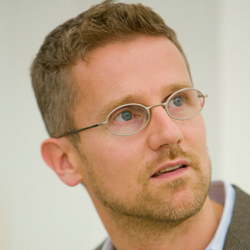 He is also a founding partner of the international design and innovation office Carlo Ratti Associati (CRA). Drawing on Ratti’s research at MIT, the studio develops innovative design projects, merging high-profile architecture and urban planning with cutting-edge digital technologies, so as to contribute to the creation of intelligent cities and buildings. Significant achievements of the office include the masterplan for a creative hub in the City of Guadalajara, the Future Food District at Expo Milano 2015, the renovation of the Agnelli Foundation HQ in Turin and the Digital Water Pavilion at Expo Zaragoza 2008, with the latter named among the ‘Best Inventions of the Year’ by Time magazine. Product design projects range from experimental furniture for Cassina to light installations for Artemide and responsive seating systems with Vitra.